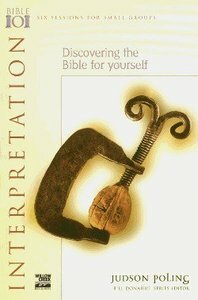 Judson Poling introduces principles of interpretation that will help you discover the meaning of God's Word and apply it to your life. A Willow Creek Resource. - Publisher You read the Bible to understand. But how do you know that you are really getting the intended meaning?This Bible 101 study guide by Judson Poling outlines essential principles for finding the meaning of God's Word through inductive study. You'll learn to look at context and culture, and then to apply God's truth to your own life. You'll understand what the Bible says to you, here and now. About "Discovering the Bible For Yourself (Bible 101 Series)"
You read the Bible to understand. But how do you know that you are really getting the intended meaning?This Bible 101 study guide by Judson Poling outlines essential principles for finding the meaning of God's Word through inductive study. You'll learn to look at context and culture, and then to apply God's truth to your own life. You'll understand what the Bible says to you, here and now. Poling is co-author of the bestselling series, Walking With Poling is co-author of the bestselling series, Walking With God. God. Session 5: What Does The Text Say For Today?